Many site owners would love to see more data being separated in Google Search Console. One of the requested ones is splitting out AMP and splitting out voice search queries is another. The question came up in last week’s Google Webmaster Office Hours and John Mueller said that is something they are discussing possibly doing. One of the major issues with providing search query data for voice search? Voice queries tend to be much longer than typed queries. And the longer the query is, it increases the possibility it would get filtered out of Google Search Console because of very low volume. I don’t know what the exact plans are there but we have discussed something like that to kind of make it easier to pull out what people have used to search on voice and what people are using by typing, similar to how we how mobile and desktop set up separately. I think some of that might be trickier because in practice voice queries are more long form, they’re more like sentences and real questions and sometimes those exact queries don’t get used that often, so we might be filtering them out in Search Console. But it is definitely something we’ve talked about, we’ve looked into different other types of queries or search results as well to see if there is something we could be doing there differently. If you have any explicit examples, of specifically how you think this type of feature, or any other feature in Search Console could make it easier to really make high quality websites, to really get some value out of Search Console in a way that makes sense for you to improve your service for your users, then we would really love to see those examples. 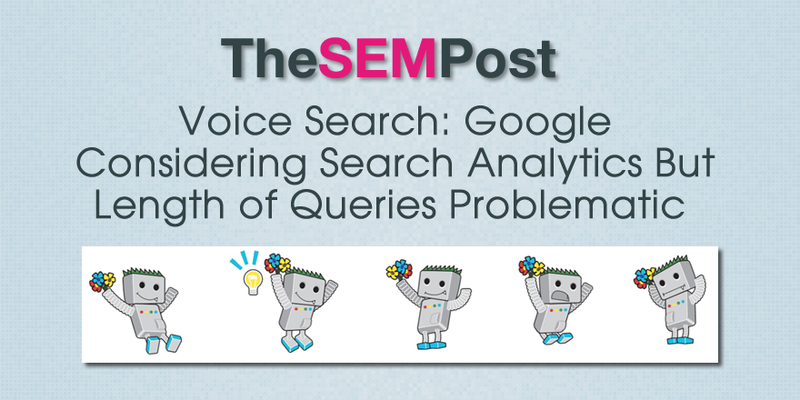 It does raise an interesting point though – how valuable would having extremely long voice queries in Search Analytics be, when they might only be searched on a couple of times. That type of data isn’t as actionable as when you have queries with much higher volume. But it would be valuable for trends. It also would be great for filling in missing gaps in content on a site. Because voice queries are usually more detailed, it is even easier to spot when a landing page from one of these detailed search queries might not be meeting the searcher’s expectations, and when content should either be added to or a new article created that would answer the voice query. There is also the issue that often times voice searches are chained… and it wouldn’t make much sense for someone to see something more generic like “when was it” as a search query when it was connected to the previous search about a specific event. Seeing the query “when was it” or “where is it” would be a pretty useless metrics for marketers to have if Google wasn’t showing the chain of searches that led to it. And when a marketer searches for “when was it” and doesn’t see their site anywhere in the top 1000 results, then users could consider the data questionable, when it was a result of a chained query. And that starts to get complicated fast. So while it would be great to have voice search data in Search Analytics, it does pose some unique challenges with displaying data that don’t exist with regular search. It doesn’t appear that anything is being worked on, but rather it is something that Google is still discussing possibly adding to Search Console.